When I first moved to Sydney I went to a photographic exhibition one Saturday in Paddington. It was by Sebastiao Selgado, part of an exhibition of prints from his book 'Workers'. 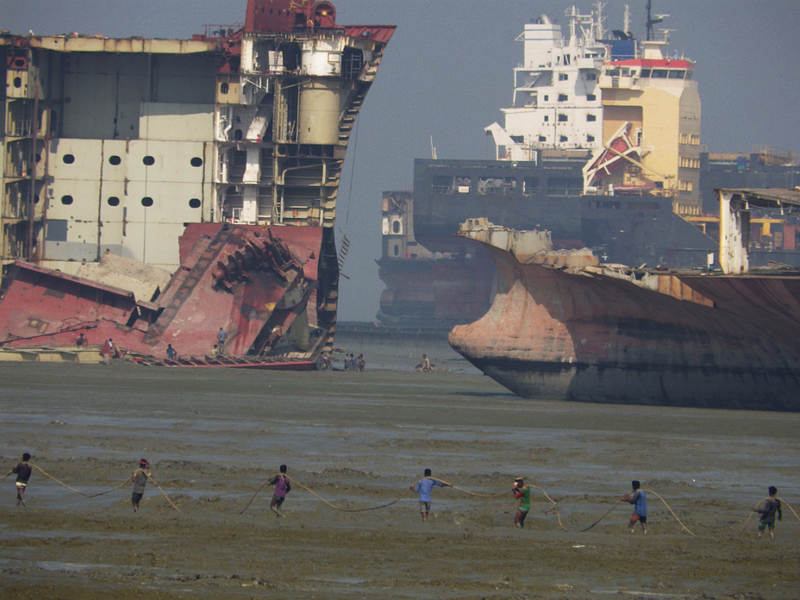 There were some stunning shots from around the world, but it was the images from the shipbreaking yards of Chittagong that stuck with me. To get to Chittagong is fairly easy. I took a daytime train from Dhaka, and it took only six hours. Not as romantic as travelling on the Rocket paddle-steamer, but far quicker. I always imagined Bangladesh as being mainly urban, but the journey consisted mainly of green fields and the many waterways that make up this South East Asian country. The shipbreaking yards are about 10 Km north of the city, so I took an auto-rickshaw, a motorbike with driver and the passenger in an enclosed cage behind, through the snarling traffic. There is about a hundred ship breaking yards on the coast and they were once open to the more adventurous tourist, but no longer. The photographs of Selgado and NGO investigations into the high mortality rate of workers dismantling ship by hand without protective clothing were bad publicity for the shipyards. I tried to enter five different shipyards and was met with locked gates, shakes of the head, dismissive hand gestures and agitated security guards. I tried a different tack, and found a way down to the beach and began to make my way to a shipyard across the oil-stained mud. Within minutes I was apprehended by a security guard making it clear I could not proceed while covering his face from my camera. Time for a bit of improvisation. 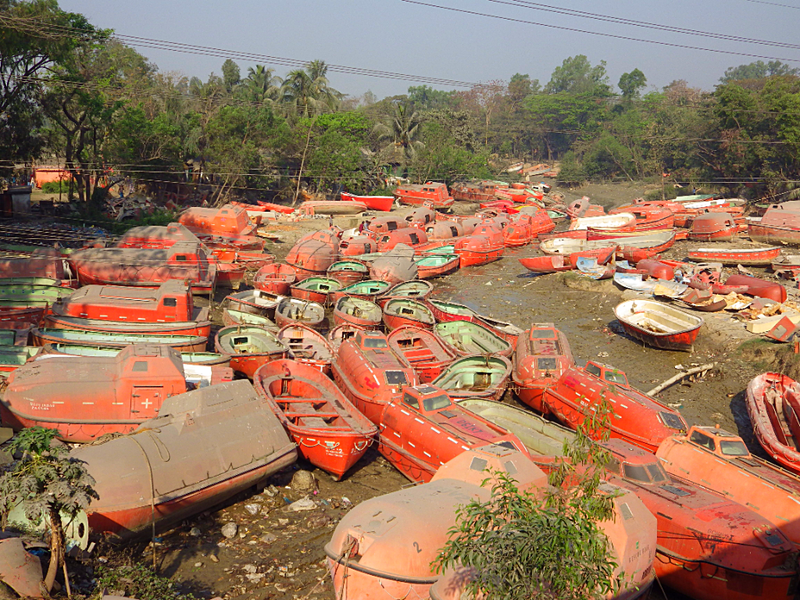 I had noticed a fishing harbour full of old lifeboats at Kumira, a few kilometres north. When ships are broken up everything is sold. Obviously, the steel is the most important, and that is the major input into Bangladesh's recycled steel industry. But everything on the ships is sold, and the shops along the highway from Chittagong are full of ladders, emergency gear, and the rivers are almost blocked by the ubiquitous lifeboats. They are now used up and down the Bengali coast by fishermen, at least, it hopefully improves their safety. There is still a huge surplus of them and I had enquired the price of a lifeboat and was quoted US$200, which sounded pretty reasonable to me, and I had not even started bargaining. I would, of course, have to sail it back to Australia, and would probably be intercepted by the Border force security who have an obsession on 'turning back the boats'. My auto-rickshaw driver took me to Kumira where we negotiated a $US10 trip out to see the ships at high tide. There was little the shipyards could do to stop me investigating and photographing the ships to my hearts content. 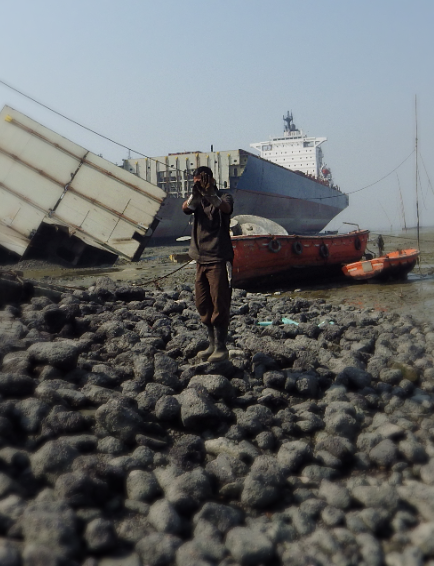 Most of the ship breaking occurs at low tide, but there were still workers dismantling the interiors who stopped what they were doing and grinned and waved for the camera. The sheer number of ships that were run up to the sand was astonishing. Up to 200 are being broken up at a time, by hand, in what is one of the biggest ship breaking areas of the world. Not surprisingly the pollution was terrible, the water was full of oil slicks and other detritus that had been washed out to sea. Another benefit of the lifeboat trip was that I could see a large jetty sticking out into the sea near Kumira, which would prove to be perfect for photography of nearby shipyards at low tide. I made my way onto the jetty after the lifeboat made its way back to the harbour, the tide was rapidly going out at this stage, and the jetty also has many points where you can make your way down onto the oily mud. Even Wellington boots would not be much use here, as I sank to my knees within a few metres of the steps. A great photo opportunity, but not so good for my boots or trousers. I stayed in Chittagong overnight before returning to the shipyards. I wanted to find out more about the workers who toiled there. As before I was unable to actually enter any of the breakers yards, I tried four different ones and was met with the same response, even with monetary encouragement. So decided to hang around outside one of the largest ones and wait for the workers to finish as the tide came in. With an interpreter, I found the workers more than willing to talk and tell me about their lives. We moved away from the yard gates, where security was paying us a little too much attention, to a spot in the shade of a large tree. About twenty workers came and sat down with me and although I took photographs I will not publish them here for obvious reasons, while names have also been changed. We work seven days a week, two shifts a day of 6 hours each when the tide is out. Very well, we can make US$200 in a good month. (FFP: This is four times the average Bangladeshi wage). These jobs are really sought after, we consider ourselves lucky. What about injuries? It is pretty dangerous work. Look at Ahmed here (pointing to a grey-haired man at the back). He has worked here for almost forty years and I don't think has missed a day off work (much laughter). But, yes, things do happen. We all know workmates who have lost limbs or worse. It is much better than it used to be. There was a time when workers died almost every day. It still happens but not so much. The bigger problem for us is finding work. 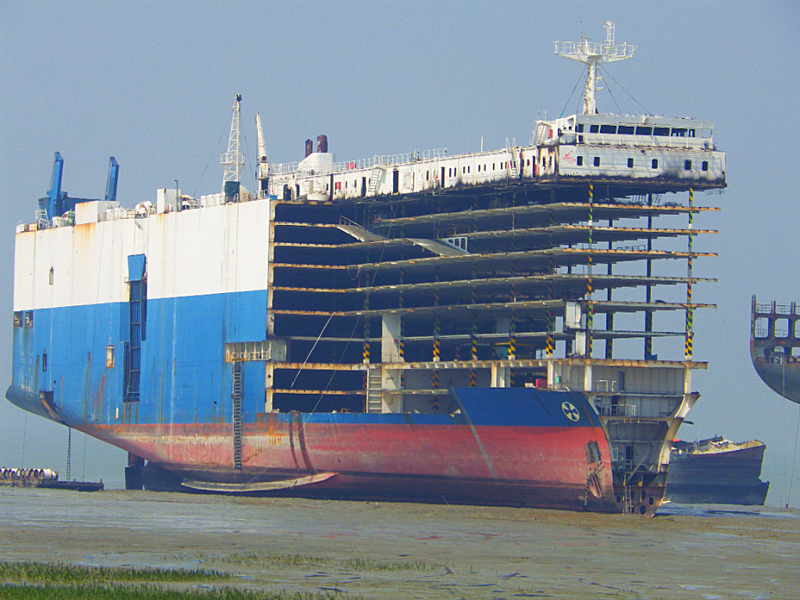 The ship breaking yards are not as full as they used to be, and sometimes we have to wait three months with no money before another ship is driven onto the beach. That is hard. No other shipyard will take us on as they all have their own group of workers. What about wearing protective gear? Those who use welding equipment get masks but we don't need anything else. The big problems are falling from a ship, so you gotta take care, and being hit by bits falling off. So you gotta trust your workmates (laughter from the group). Even though the welders have gear now I would not want that job. I try and work as far away from them as I can, I have seen them cause explosions. At this point, a manager accompanied by several security guards appeared and made it clear that no one was to talk further to me. Not wishing to harm any of the worker's job prospects I made my way back to the auto-rickshaw and headed back to Chittagong, stopping on the way at one of the many shops lining the road to pick up the odd souvenir. 1. Check tide times for planning your trip. 2. Hire an auto-rickshaw for the day. Cost approx US$20. 3. Visit Kumira to hire a fisherman to take you out on his lifeboat at high tide (Cost US$5 to US$20) depending on your negotiating skills. 4. Walk onto the large jetty near Kumira for great shots of breaking up ships, as long as the yards next to it are busy. Take shoes and socks off and take a stick to ensure you will not disappear into the sludge. 5. Visit the shops on the side of the road near Ghoramara to pick up the ultimate ship breaking souvenir.